October 2015 - HGR Inc. I am often asked why or how I got started as an industrial artist. Well, that question is very difficult to answer because I really don’t know the “how” or the “why.” Over the years, it just happened. I began repurposing or re-envisioning things long before there was a trendy name for it, but I was doing just that. A bicycle turned into a garden table, and a vintage, 10-pane French door is now a showpiece for family photos that hangs over our couch. My passion leans towards the industrial and rusty side of things. Antique car jacks are lamps. Industrial machine bases become the foundation for a table. Discarded Tonka trucks are solar-powered outdoor garden lighting, and the list goes on for far too long. After years of creating this type of funk-tional art at home, I was overwhelmed with completed works and began offering them to the adventuresome people that enjoy the truly “different” things in life. 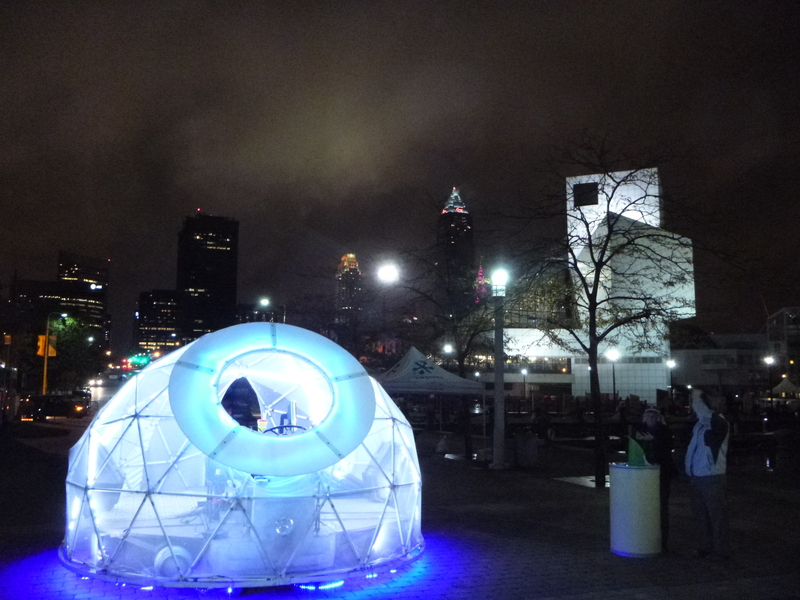 This led me to form a business called Rust, Dust & Other Four Letter Words and open a studio in November 2014 in The Waterloo Arts District at Article (art in cleveland) at 15316 Waterloo Road, Cleveland. While nearing retirement, the hope is that Rust, Dust & Other Four Letter Words will carry me through the next stage of my life. For the most part, my passion has been widely accepted by the non-conventional individual who is looking for that conversation or statement piece for his or her home, office, loft or for an outdoor entertaining space. I love working with found objects and creating something uniquely one-of-a-kind. Time-worn barn siding, pieces and parts of vintage items, salvaged industrial items or any other material that most folks would consider junk – that’s what I look for and more often than not those items “find” me. Frequently, I make trips to HGR’s showroom to find inspirational pieces. I rarely go in there looking for something specials. I love seeing the look on my salesman Rob’s face when I show him what I’m purchasing. It is usually followed by, “What are you going to do with that?” I reply, “I don’t know, but isn’t it wild or cool.” Months later, when I’m in there for new purchases and I show him the completed piece, he is often amazed by what I did with the raw material I found in the showroom. Fifteen years ago, I was moving my equipment rental store from one location on East 185th Street to another location on East 185th Street. 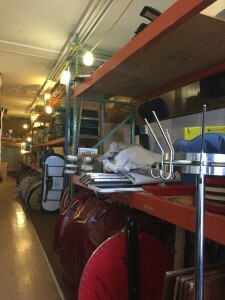 Our equipment had always been stored on shelves built by my father out of two-by-fours and sheets of plywood. I realized that I was going to need a significant amount of new shelves in the new store, and I started planning a very expensive trip to Home Depot. Well, thank goodness for my daughter. She sat down at the computer and Googled “shelving.” Two minutes later, she comes running up to me all excited, “I found a store near here that sells exactly what you need!” Let’s just say that I was skeptical. So, we got the directions from the website and headed off on our short journey. 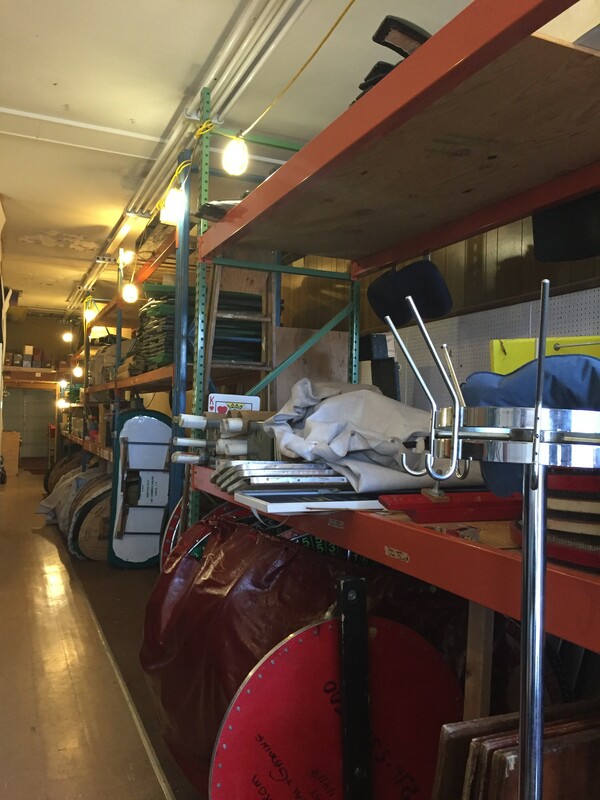 I was greeted by a friendly staff person who assured me that HGR definitely had pallet racks. We went for a long walk through aisles and aisles of what I could only imagine were parts to build really big robots. In no time at all, we arrived at a pallet rack mountain. The staff person left my daughter and me at the mountain to sort through the hundreds of different colored and different sized racks. A couple of hours and $285 later, instead of $5,000 later, I had enough racks to fill my entire store. Not only did I save a fortune on not buying lumber, these racks are indestructible and perfect for the job. I’ve used them every day for the last 20 years. A big thank you to my daughter and HGR for solving my storage dilemma and for saving me a bunch of money in the process. There are so many cool things at HGR. Artistic talent with an industrial bent runs in the Schmidt family. 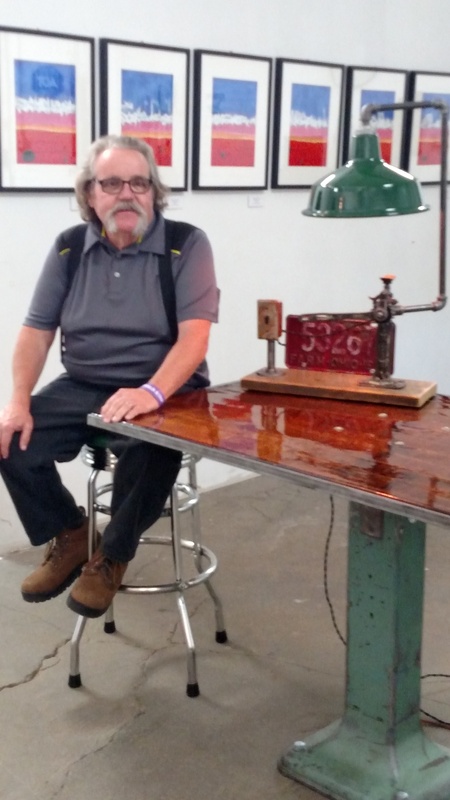 Jerry Schmidt, owner of Waterloo 7 Studio/Gallery, grew up in Mentor, Ohio, as the son of Fred Schmidt, who worked for the New York Central Railroad and was a found object and steel sculptor in the 1950s and 60s. Schmidt worked as an iron worker for Local 17. When his dad was still around, Jerry didn’t build; he simply helped build his father’s works of art. While Jerry’s work has been compared to his father’s, he thinks his is different from the elder Schmidt’s, whose art was more abstract. His father would not have made detailed or literal pieces, such as chairs and mailboxes, or used glass panels or kinetics (moving pieces). In spite of that, he says, “There’s a force that brings me right back to it” due to his father’s influence and style, the way you can tell what school a painter came from because his work is influenced by the master with whom he studied. 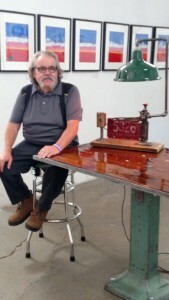 Schmidt moved to Collinwood in 1980 and bought his studio space in 2002. In 2001, when his father passed, he took up the [welding] torch and came into his own as a metal sculptor, working with rolled sheet steel, steel mill slag, and industrial scrap and surplus. He semiretired six years ago to work full time on his art. 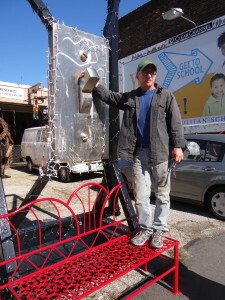 Now, his son Tyler, a third-year apprentice iron worker with Local 17, and his seven-year-old grandson are metal artists. All four generations’ work are represented in the studio where Roxy the guard dog sings hound-dog songs to a steady stream of friends and guests who visit. 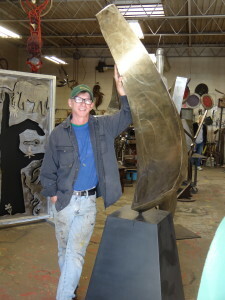 Currently, he is working on two pieces for his most recent commission to be installed in 2016 at the DoubleTree by Hilton Hotel on Lakeside Avenue: a 17-foot by 16-foot stainless steel and stained glass wall hanging on the third floor that will be visible when guests look up from the mall and an 8’6”, curved, entwined, abstract, stainless steel sculpture on a pedestal for the lobby. When pitching a commission, he builds a “marquette,” or scale model. 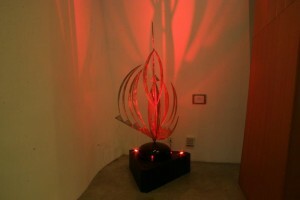 To make the actual installation piece, he rolls the metal, plasma cuts it, welds and grinds it, rubs the surface with boiled linseed oil then uses a pumpkinhead torch to heat it and burn patterns into the metal. “Each form is an element, but the finish is the hard part,” he says. When asked which piece he is most proud and believes launched and defined his artistic career, he says it is the piece installed in 2005 in the Peter B. Lewis Building at Case Western Reserve University. Schmidt is passionate about his sculptures not only being abstract, but also being imperfect. He says, “There is no such thing in the world as a straight line. Somewhere, there’s a kink in that line.” And, he believes in balance. 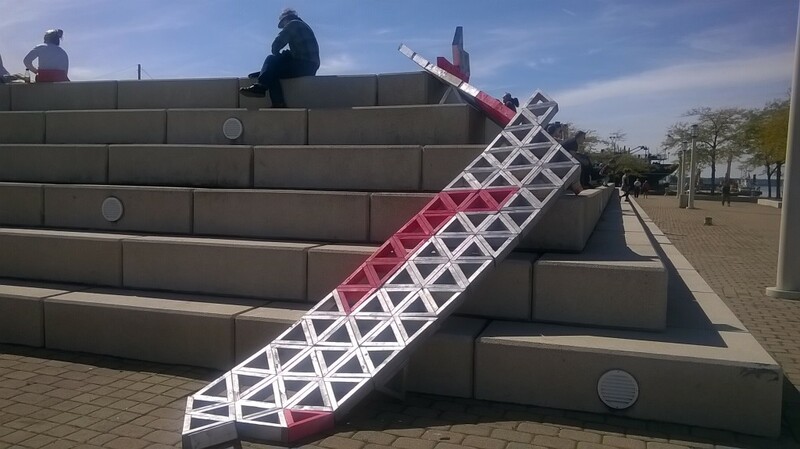 He had 12 pieces at Ingenuity Festival this month that withstood the wind and didn’t fall over as so many other sculptures there did. “I was a happy camper,” he says. And, he is. Stop by to meet Schmidt and see, hear and taste his work. You will walk away happy, too. In partnership with Manufacturing Advocacy & Growth Network (MAGNET), HGR is building the materials to create a manufacturing resource center inside of its customer lounge. The center will house pamphlets, handouts, books and periodicals that provide information about educational and manufacturing opportunities, as well as information about MAGNET’s services and programming. HGR also will create an online center with links to additional resources. 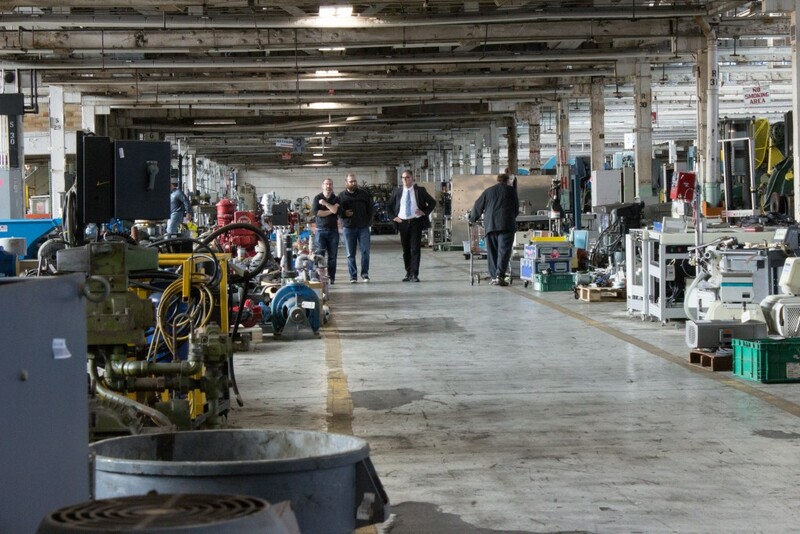 Some of the organizations that will have information available in the center include: Fabricators & Manufacturers Association, International; National Association of Manufacturers; the five Ohio regional representatives of the Manufacturing Extension Partnership (MAGNET, TechSolve, CIFT, PolymerOhio, APEG and FastLane); local colleges and universities with industrial, technical and manufacturing courses and programs; Ingenuity Cleveland and the Nickel Plate Historical & Technical Society. Currently, HGR is in the information gathering and solicitation phase. If you or your organization have information relevant to science, technology, engineering, arts and manufacturing (STEAM) educational opportunities/organizations, please contact Gina Tabasso, marketing communications specialist, at gtabasso@hgrinc.com. Once the resource center is up and running, HGR will make an announcement so that you can stop by to peruse the materials. The Iron Architect participants ran through HGR’s showroom on Oct. 1 with shopping carts to collect a “special ingredient” that needed to be incorporated into the challenge. These items then were donated by HGR to the artists. According to NASA’s Endeavor Science Teaching Certificate Project, after decades of education reform and efforts to place value on science, math and technology in the schools, in the 1990s the National Science Foundation created the acronym STEM to promote science, technology, engineering and math to emphasize that these subjects should be synchronously taught, not taught in isolation, since they do not exist in isolation in the workforce. The Ohio Department of Education states that the goal of STEM schools is to foster intellectual, entrepreneurial and technical talent vital to Ohio’s future economic growth and prosperity by infusing high-level mathematics and science into curriculum. In HGR’s backyard, Euclid High School is a STEM-designated school and has implemented the STEM program during the past three years by offering a hands-on STEM class; by creating a robotics club where students learn about robots and build one from a Lego kit; by forming a competitive robotics team that plans, designs, buys, manufactures and assembles the parts to build a battle robot; by adding a CISCO computer lab for programming and networking courses; by developing a planetarium to study the constellations and phases of the moon; by incorporating STEM aspects in regular classes; by participating in STEM conferences; and, most recently, by building a common science lab area that includes Vernier data collection equipment, motor and force detectors, an air track to study the momentum of objects and a Vande Graaff electrostatic generator. 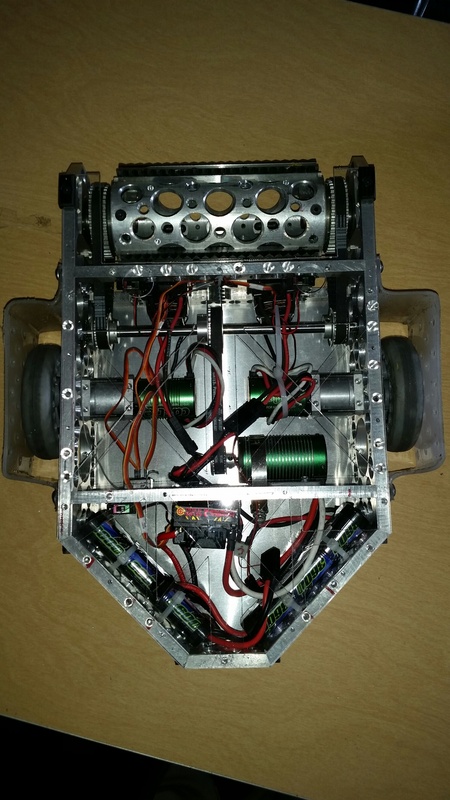 Robotics team members continue learning new skills since they are required to document meetings and planning stages through notes and photos, research the best prices for parts, put together a plan, create specs and work as a team. 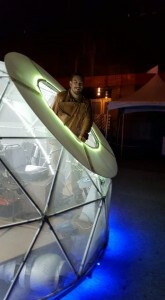 According to Bob Torrelli, Euclid High School Science Department chair, physics major and EHS science teacher for 16 years, “They learned how science and technology work with math in society. 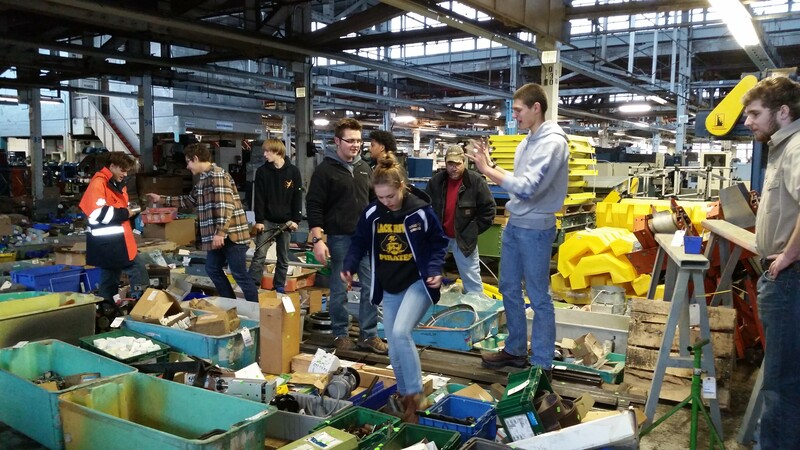 “ Local businesses, such as HGR Industrial Surplus and SC Industries, Inc. supported the team by providing financial backing, materials, workshop space, and technical manufacturing assistance. I’ve always had an interest in building things for as long as I can remember. I’ve built small things throughout my life, but recently my scale has gotten larger. 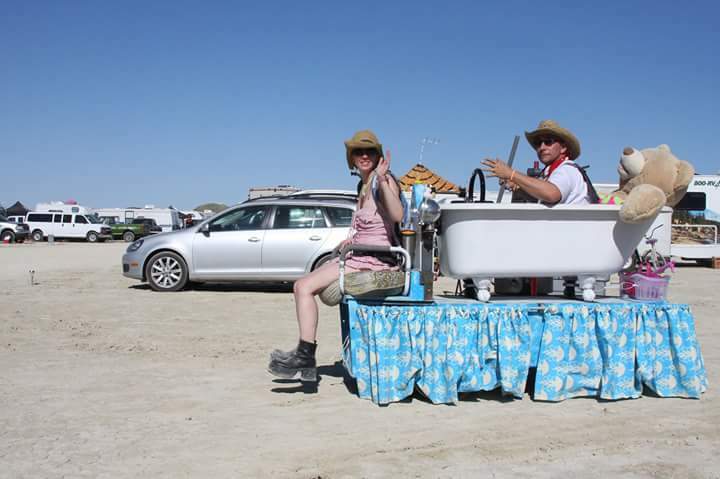 In 2013, I was asked by several friends to help build an art project for Burning Man, an annual gathering in Black Rock City, Nevada as an experiment in community and art. It was a four-person Simon Says game that shot fire. 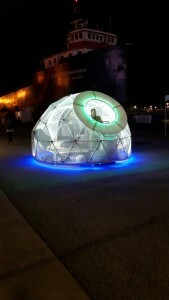 While we were there, I had my first experience with mutant vehicles and art cars, and it really got me inspired. 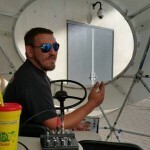 Last year, I helped the same group of friends build a small mutant vehicle called BT-1. This was a drivable claw- foot bathtub that was mounted on an electric-powered parts mover from HGR. After I helped with that, I knew I had to make my own vehicle. My mutant vehicle is called the Wandering ii. 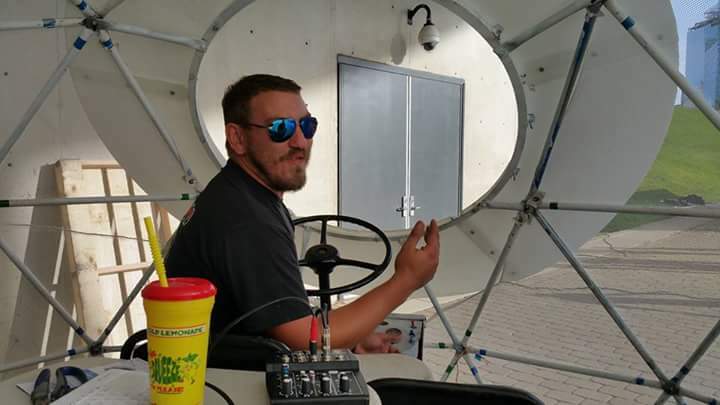 It is based off a propane-powered maintenance vehicle that I got from HGR last year. 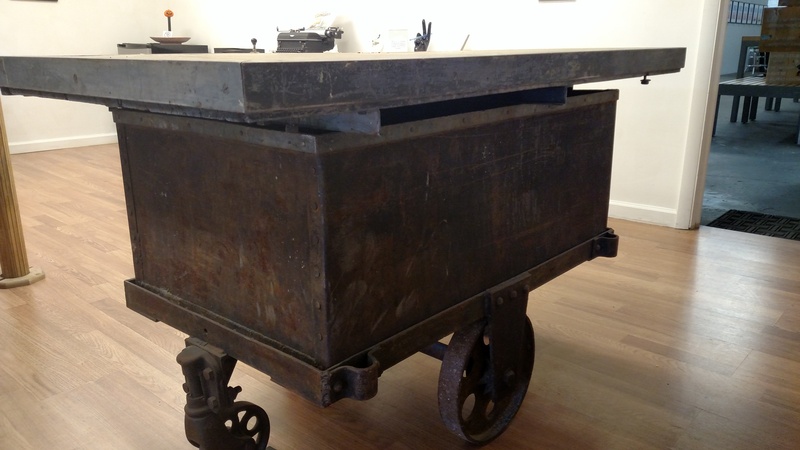 In its former life, it was a mobile welding cart that was inside of a Ford motor factory. The inspiration behind it came from our theme camp at Burning Man, the wandering ii’s. HGR was a major source for parts and equipment for this and other builds I’ve done. Last winter, I bought a bunch of wire, solenoid valves, and electrical components for an electronic drum set that shot fire. Any project I do starts with a trip to HGR. I love going there to rummage through the aisles of great stuff and find inspiration for new projects. My salesmen always love hearing about the stuff I’m working on. 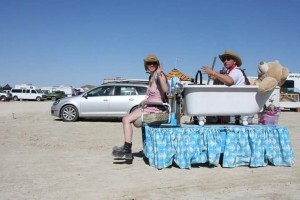 My vehicle will be out at Burning Man next year, and there are talks about possibly having it at a few events around town. 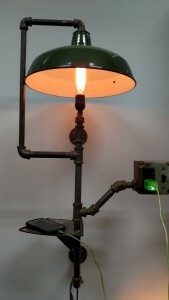 I have been thinking about making some repurposed furniture from industrial parts and pieces. I’m always working on something and can’t wait to see what I can find at HGR! 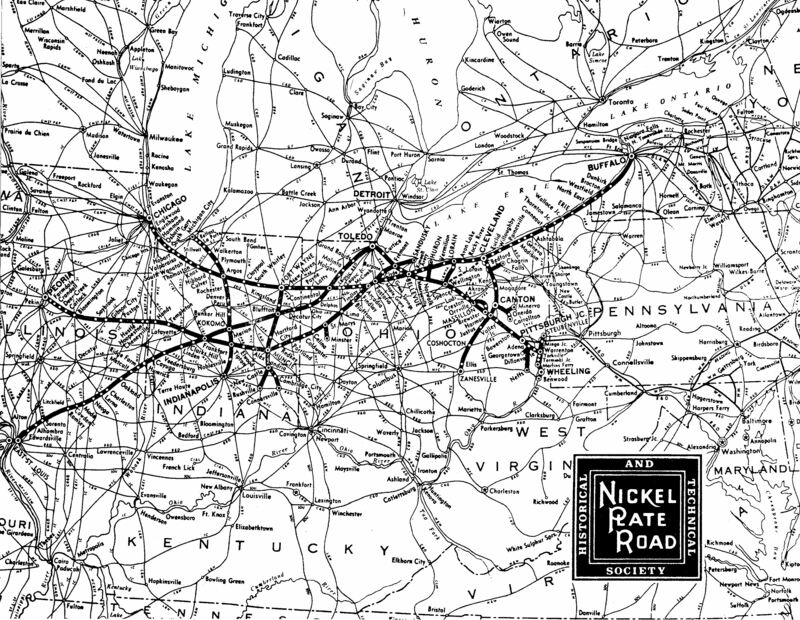 The New York, Chicago & St. Louis Railroad Company, the Nickel Plate Road (NKP), was formed in the early 1880s to connect New York in the east to Chicago & St. Louis in the west. Completion of the Chicago – New York segment occurred in fall 1882. The nickname Nickel Plate generally is credited to the newspaper in Bellevue, Ohio, when it ran several editorials talking about the “nickel plated railroad.” The nickname stuck. It would be another 40 years before the connection to St. Louis was added to the system. This occurred in 1922 when the railroad acquired the property of the Toledo, St. Louis & Western, the Clover Leaf, which ran from Toledo to St. Louis. Also in that same year, the Nickel Plate secured control of the Lake Erie and Western Railroad, a line that ran from Sandusky, Ohio, to Peoria, Illinois. This made up the primary properties of the Nickel Plate until 1949 when the Wheeling & Lake Erie was added to the system. The “Wheeling” ran primarily from Wheeling, West Virginia, to Toledo, as well, and also had branches to Lake Erie and the coalfields of eastern Ohio. The NKP was known for its high-speed service. Trains would rocket across Indiana and Ohio on straight and level steel tracks to deliver fresh meats, vegetables and other perishable commodities to Buffalo where they were forwarded to the eastern seaboard. Interchange points in places, such as Frankfort, Indiana, Ft. Wayne, Indiana, and Bellevue, Ohio, were operated on clockwork-like schedules to keep the freight moving, and moving fast! 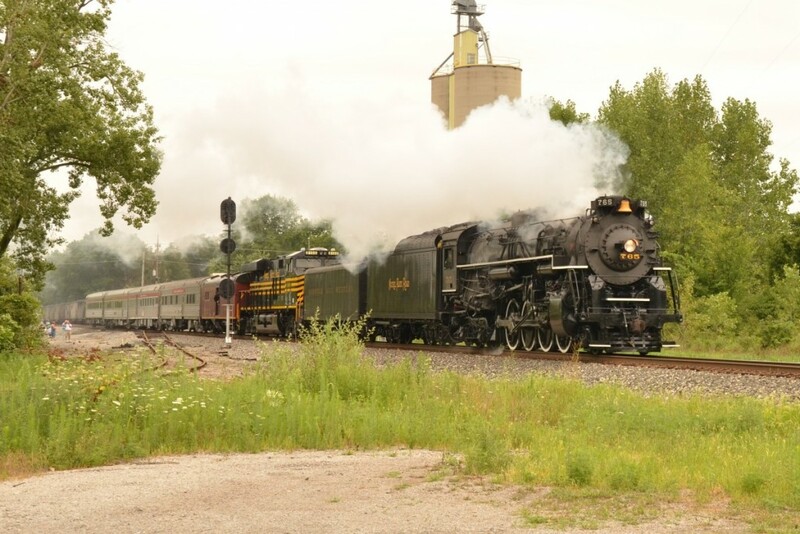 Through the late 1950s, the railroad primarily was powered by more than 110 fast and powerful steam locomotives, many of them built in Lima, Ohio. One of the industries served along the NKP’s Cleveland to Bellevue main line was the former GM Fisher Body Plant located in Euclid, now owned by HGR. The plant had an active rail spur on which Nickel Plate local freights delivered raw materials and picked up finished goods for the GM facility. The Nickel Plate survived the Great Depression, served the United States with pride during World War II and performed spectacularly during the 1950s. But the changing economy and business environment caught up with it, and, in 1964, the NKP merged with the Wabash Railroad and the Norfolk and Western Railroad. 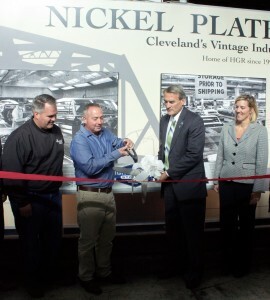 Thus, the corporate life of the Nickel Plate Road ended. Today, the history and the heritage of the New York, Chicago & St. Louis Railroad is being preserved by the 900-member Nickel Plate Historical and Technical Society. Formed in 1966, this 501(c)(3) nonprofit society is the oldest continuously operating railroad historical society in the United States. Its purpose is to obtain, preserve and disseminate information and material related to the Nickel Plate and its predecessor, constituent and affiliated railroads. The Society publishes a quarterly Nickel Plate Magazine and a Modelers’ Notebook. Some of these materials can be found in HGR’s new manufacturing resource center in its customer lounge. There are several programs in place to collect & preserve materials related to the railroad, to assist with others’ preservation efforts and to keep alive the memories, history and traditions of this fine railroad. The Society’s business is conducted by an all-volunteer board of directors, and an annual convention is held each year in a city that was served by the Nickel Plate. 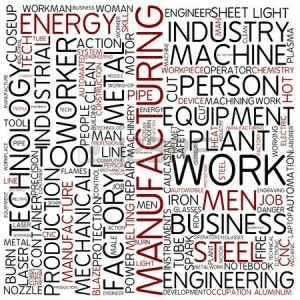 According to the Fabricators & Manufacturers Association, International (FMA), “Manufacturing Day is a celebration of modern manufacturing meant to inspire the next generation of manufacturers. 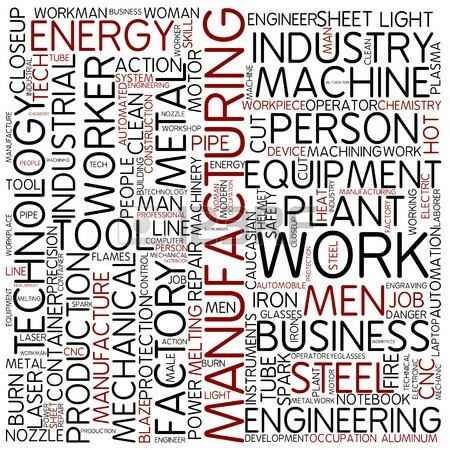 Although Manufacturing Day officially occurs on the first Friday in October, any day can be Manufacturing Day.” FMA co-produces the day with National Association of Manufacturers and Manufacturing Extension Partnership in order to encourage manufacturers nationwide to open their doors to the public to connect with future generations and enhance the public image of manufacturing by addressing challenges and misperceptions. 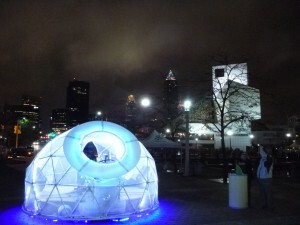 This year, approximately 2,000 events took place. To join the Manufacturing Day celebration, HGR participated in MAGNET’s [M]Power Manufacturing Assembly that addressed the challenges of today’s changing manufacturing landscape at the John S. Knight Center, Akron, Ohio. 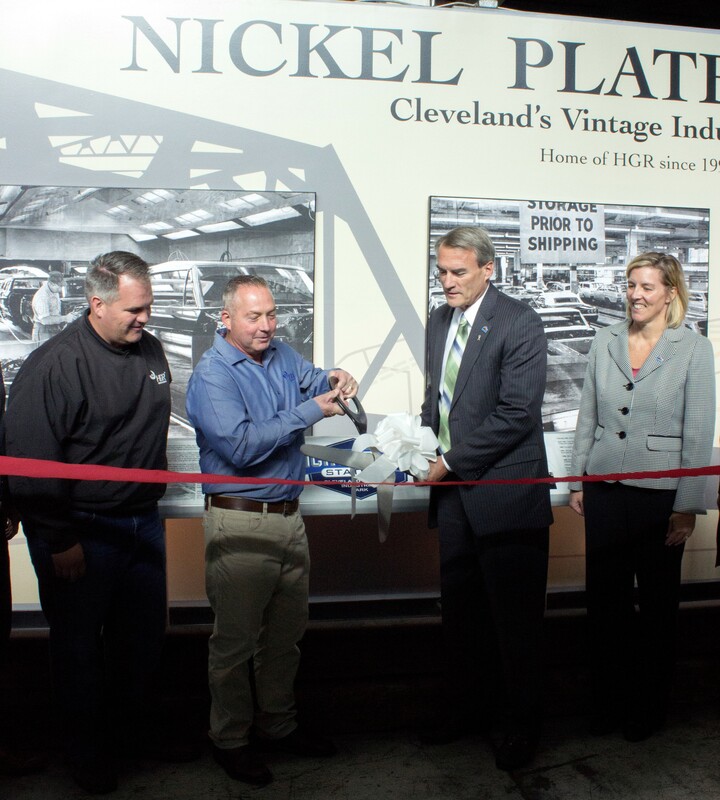 Then, on Oct. 1, HGR hosted its Nickel Plate Station facility dedication ceremony, customer appreciation sale and luncheon; unveiled a site-history timeline wall and a manufacturing resource center; and recognized the Euclid High School Robotics Team for its achievements.